The new rules don’t simply cut costs. The retirement betrayals, slashes to health care, and layoffs give employees a reason to actively hate their employer and passengers an excellent reason to avoid the troubled airline. American Airlines began laying out a timeline for changing work rules and benefits for union workers as it started to implement new contracts as part of its bankruptcy restructuring. For flight attendants, mechanics, ground crew and other nonpilot union workers, American said it will freeze retirement plans with no new benefits accruing after Oct. 31. After that, the company will begin contributing a dollar-for-dollar match up to 5.5 percent into a 401(k) plan for employees. Both pilot pension plans will be frozen on Nov. 1 and the “B plan” will be terminated on Nov. 30 with no more company contributions made after that date. Also, some terms of the pilots contract changed immediately, including portions covering code-sharing with other domestic carriers and allowing American to pursue contracts with other commuter carriers to fly more 79-seat jets. American Airlines plane on the tarmac. Photo by Sam Beebe. Details of the changes were sent to employees after a bankruptcy judge approved new contracts with three work groups. 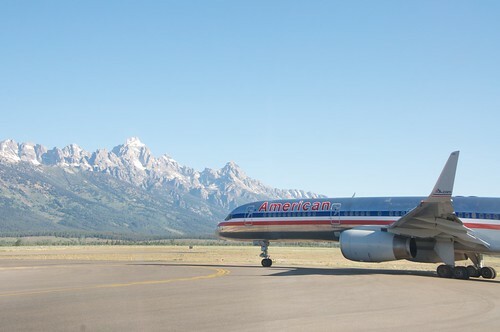 American has reached new contract agreements with all of its unions except the pilots. American also officially announced that it will close its Alliance Fort Worth maintenance facility and hand over the keys to the city by April 2013. As reported earlier this week, the company told union leaders last Friday that the 1.6 million-square-foot facility will close by the end of the year, with 1,090 workers to be laid off on Dec. 15. As it had previously stated, American plans to keep its engine repair shop, which is a joint venture with Rolls-Royce, open at Alliance. Employees who retire on or after Nov. 1 will be placed in the new retiree medical program which provides two medical options at full cost to the employee. New health benefits will be implemented for all active employees on Jan. 1 as part of the annual enrollment that will be held in November. Lynn added that layoff notices will be mailed to employees who may be affected; however, she expects the number of layoffs will be “substantially less” than the company had originally anticipated because of “early-out” programs with the flight attendants and union members represented by the Transport Workers Union. While some code-sharing terms and retirement changes became effective on Wednesday, pay rates for the American pilots won’t change until Oct. 1. Pilots will be paid based on groupings of similar-sized aircraft into pay bands, as laid out in the company’s April 19 term sheet. Night pay has been eliminated and the company will not guarantee protection for military leaves of absence. The company also plans to proceed with the closure of its St. Louis pilot base which it acquired as part of the TWA merger in 2001. The Allied Pilots Association said it filed more court documents to appeal the bankruptcy judge’s ruling that allows American to reject its old contract and impose terms that the carrier says are necessary to restructure. “APA appealed Judge Lane’s Aug. 15 ruling — which denied AMR’s original 1113 proposal — was based on what we view as a series of adverse findings and conclusions,” the APA said in a message to pilots on Wednesday evening.